In the nearly two years ministering within a children’s hospital I have witnessed various things that have so overwhelmed me that I am learning not to be surprised by anything. I am learning to take what I see in stride. When I consider what some of these precious children are having to deal with physically not to mention emotionally and mentally, I am simply amazed at these kids and their parents. Just the other day I noticed a little boy with his father. The little fellow couldn’t have been more that four years old. Working in a children’s hospital you hear children’s voices a lot. Sometimes these voices are happy and playful and at other times they are expressing pain or sadness due to their present circumstances. This little guy was exercising his voice by sounding off at the top of his lungs. Now ordinarily hearing a child’s voice isn’t anything to write home about. However, the situation I am describing here relates to why the little boy was making such noises. 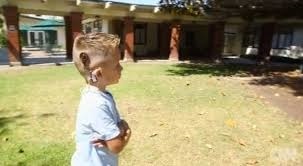 You see, this little guy had two cochlear implants on either side of his skull. He was so fascinated with his voice that he not only wanted to hear himself speak, he wanted everyone around him to hear his noises as well. I walked up to him and his father and I asked his father how long has he been able to hear his voice. The father said his son has been able to hear his own voice for about a year now. He told me that he does not wear the implants all the time but when he does he just loves them and expresses himself like you are hearing him now all the time. I was simply awed by this experience. I felt an emotional surge coming up from within me as tears began to flow from my eyes. Can you imagine what it must be like to not hear any sounds. From a child’s perspective not hearing any sound would not mean much since the child would not have anything to compare it to. They would just go through their lives perhaps thinking what they are presently experiencing is normal. It would not be until someone who has hearing, like his or her parents, choosing to investigate the possibilities that their child is deaf, that something would be done about it. This puts in place for me the idea of spiritual hearing. For those who are deaf spiritually, meaning they have not heard the sound of the Spirit of God that continually pours forth speech, tends to go through life in a kind of spiritual ignorance. Events happen whereby spiritual sounds go forth and there may be times when such sounds may be entertained but since they have nothing to compare this communication it just falls on deaf ears. When those who have become familiar with the Spirit’s communication lift up the possibilities of hearing for those who have not, an awakening of sorts can happen opening up the presented possibility. Then the practice of the pre-existing ability to listen spiritually is invoked within the hearer and the continuation of their spiritual journey is confirmed.